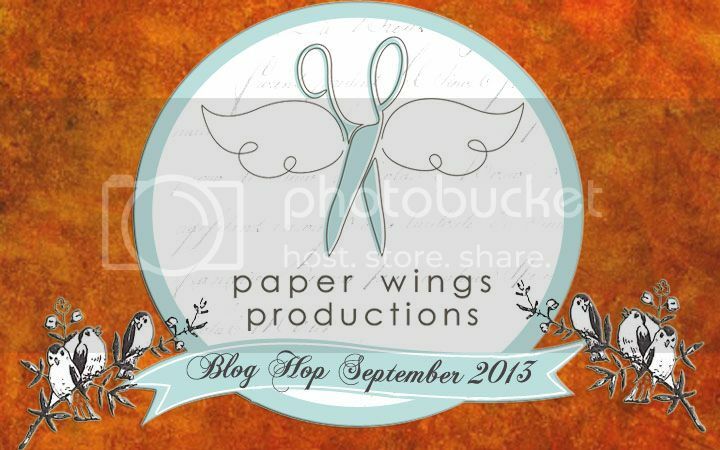 WELCOME to our Autumn themed Paper Wing Production's Design Team Blog Hop & Giveaway! If you've arrived here from Norma's blog, then you're in the right place. If you’re just stopping by for a visit, please CLICK HERE to start from the beginning. This month we’re sharing gorgeous autumn themed projects full of warm rich colors. So get comfortable and prepare to be inspired!! 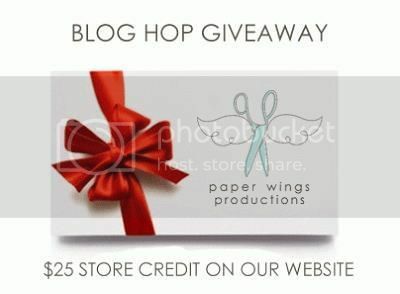 This month’s main prize is a gift certificate to the new Paper Wings Productions’ online store. be a follower of the Paper Wings Productions blog, The Aviary. visit each of the participating designer's blogs and leave them some love. Then go back to The Aviary and leave a comment letting them you completed the hop. to increase your chances of winning, like the Paper Wings Productions' Facebook page and/or invite your friends to the hop. then just come back and let us know! Be sure to leave a separate comment for each of the additional entries. The winner will be announced on Tuesday, Sept 9th, 2013 on The Aviary. For my autumn inspired project, I wanted to use the gorgeous leaves found in Leaves or Leaf and Thanks is for Giving or Mini Thanks to create a wreath. First thing I traced a circle onto the canvas with a pencil. I stamped 6 of the single leaf from Leaves or Leaf and 6 of the flourish leaf from Thanks is for Giving or Mini Thanks with brown ink onto kraft cardstock. I took out yellow and orange gelatos and colored in the leaves haphazardly and then used a brush and water to blend the colors. After they had dried I cut out all the leaves. I spritzed the leaves with shine mist. Then I added details to all the leaves using copper and red Stickles. I set all the leaves aside to dry overnight. For the canvas panel I painted it with watered down metallic blue paints. I stamped the acorn images from Thanks is for Giving or Acorn Elements in brown ink around the edge of the canvas. I colored in the edges using a gold leafing pen. I painted some of the blue paint over the gold. I then stamped in blue ink the double leaves from Leaves or Leaf. I added dots of shine mist and star dust Stickles over the canvas. I them dry overnight. On a piece of white tissue paper I stamped the sentiment from Thankful in red and brown inks. I attached the tissue paper inside the circle with multi-medium making sure to put some on the both the back and over it. 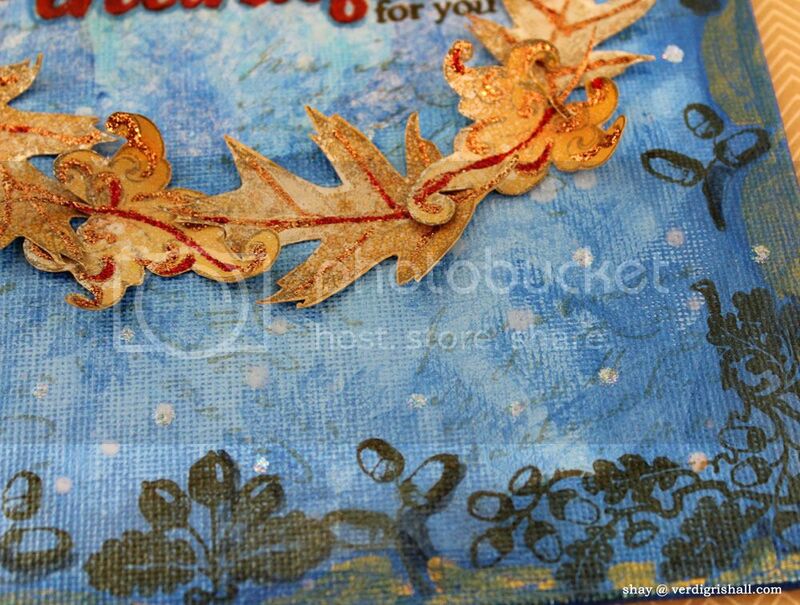 I stamped more of the double leaves from Leaves or Leaf in blue ink over the tissue paper. In light grey ink I stamped the script from Text Melange or Text in different places on the canvas. Using a copic I colored in areas of the tissue paper and also outlined the word "thankful". Following the line of the circle I adhered the leaves making sure to only put multi-medium in the center of the leaf. I fluffed up the edges of the leaves to create dimension. I think this would make a good hostess gift during the autumn season. I chose a blue background to mimic the autumn sky and to allow the leaves to pop off the color, but you could easily change up the colors to make them work perfectly for the hostess' house. That's it from me for this month's hop. Make sure to head on over to our peerless leader Carrie's blog next!! It has been a real pleasure to have you visit me today and I hope this hop inspires you to ink up some Paper Wings Productions stamps! Thank you for sharing this delightful piece with us. Love the metallic blue. Lovely! Gorgeous!! I love the beautiful colors!! wow, what an adorable canvas. love this idea for a hostess gift. This is so beautiful Shay! Beautiful canvas! Love the gold against that gorgeous blue! Shay, this is beautiful. I love the color palette and the texture in the blue background. Thanks for another grwat gift idea. Beautiful canvas, Shay! I just ordered the Leaf Set stamp from PW, and can't wait to try a wreath canvas of my own. The colors and textures are lovely. Thanks for the inspiration, my friend. A beautiful canvas, Shay! I love the leaves in the wreath and the blue background full of texture. Lovely colours and I really like that leaf wreath! This is fabulous, love the bronze colors against the dark blue! Very creative, love the colors and it would be a perfect friendship gift for sure. Gorgeous canvas, love the leaf wreath! Love the autumn hues in the leaves against the blue. So very much like autumn with her crystal blue skies!! Here on the hop. Thanks for sharing.